Corporations are struggling to keep pace with technology trends, but the real innovation challenge lies in their internal culture. In other words? The “tech issue” isn’t an issue! According to our recent survey, the top challenge companies face in corporate innovation is fostering an internal culture of experimentation and innovation (57%). Truly innovative companies focus on setting a foundation with the right people and empowering them, as well as governance, before large investments take place that lack direction, resources, or goals. These corporations are diversifying their hiring strategies in the face of rapidly disruptive technologies, consumer adoption of related trends, and the advent of new business models that emerge from the two. In order to remain competitive in an environment that embraces rapid startup innovation, corporations must focus both internally (on existing talent) and externally (on acquiring new talent) to build their talent pools. 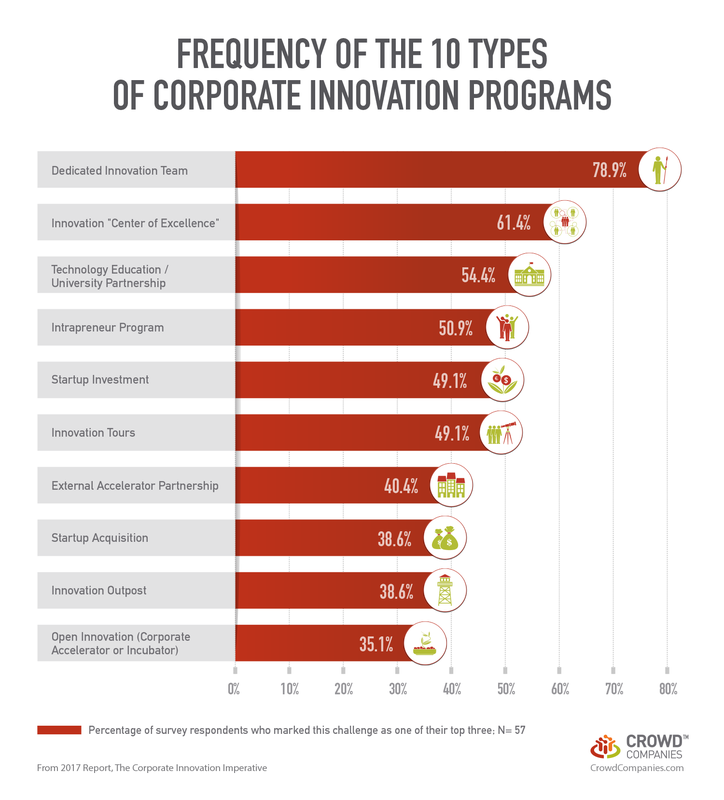 In our latest Crowd Companies report available on Slideshare, “The Corporate Innovation Imperative: How Large Corporations Avoid Disruption by Strengthening Their Ecosystem,” we uncovered three distinct manners in which the most mature corporations approach hiring innovative employees: Intrapreneurship Programs; Technology Education / University Partnerships; and Startup Acquisitions. In the full report available to Crowd Companies members, you’ll also find case examples from corporations that have found success. Internal employees — dubbed “intrapreneurs” — are given a platform and resources to innovate. These programs invest in employees’ ideas and passions to unlock everything from customer experience improvements to product enhancements and full-blown internal startups that are then launched from within the company. Intrapreneurship programs are an effective and cost-efficient way to surface ideas and shape your business without the need to purchase expensive startups or hire external talent or vendors. They enable rank-and-file employees to contribute to a culture of innovation. Through an educational partnership, corporations can tap into new university graduates, early-stage projects and companies, and the network of an established educational institution. In addition to traditional universities, there are new private versions opening up that are dedicated solely to technology training, like Galvanize and General Assembly. Partnering with educational institutions provides corporations with a first look at breaking technologies and how they’ll impact our culture through an academic lens. These partnerships are an effective way to secure new talent about to enter the marketplace. Rather than build innovation from the inside, some corporations acquire successful startups and integrate. While expensive, the startup is often already successful, and the acquisition can help the startup scale further. Acquiring startups showcases a corporation’s focus on the future and evolving its products, services, and customer experiences to meet new expectations. Stanford also shared with us that some companies experiencing a hard time hiring software talent have used “acqui-hiring” to bring people into the company. It can be a useful way to acquire talented employees along with new technologies. Corporations that retool their hiring strategy to meet the evolving talent needs of their innovation programs will reap the rewards of crafting an innovation team (or “center of excellence”) that has the expertise, experience, and drive to incite change. Our survey also uncovered that dedicated innovation teams (79%), innovation centers of excellence (61%), and technology education / university partnerships (54%) are the most commonly deployed corporate innovation programs (see figure below). This shows that companies are first focusing internally on building the right teams, getting governance and processes in place, and educating current and new employees on emerging technologies before spending time and resources on rolling out external programs or investing in the startup scene. Mature corporations understand that an innovation program is only as good as the employees behind it. Follow in the footsteps of corporations like Verizon, which have multiple innovation teams in various business units, each with talented members dedicated to both ideation and execution. This helps them move efficiently to prototype and launch new innovations. Finally, we found that the most advanced companies receive a dedicated budget from the CEO to ensure company-wide support of innovation as a long-lasting cultural mandate––even if the company is not performing well financially.